Application for Judicial Review – An Explanation | Mothers Against Wind Turbines Inc. APPLICATION FOR JUDICIAL REVIEW – AN EXPLANATION. (A) Is the REA issued to White Pines (wpd Canada) to construct an industrial wind turbine factory of 27 turbines and associated transmission and collector lines the result of institutional bias in the Green Energy Act (GEA) and/or operational bias by the various Ministries? (B) If the GEA is essential, is it fair to place the burden entirely on the minority who live in rural areas in Ontario? (C) Is the GEA necessary or even desirable? (D) What will Ontario be like after IWTs cover rural areas and will it be worth saving? The Application is based on evidence of institutional and procedural bias, infringement of natural justice, and on a denial of rights created under the Charter of Rights and Freedoms in that residents of rural Ontario are discriminated against as turbines will never, ever, be inflicted on urban communities. Evidence is by way of sworn affidavits. Currently some 15 have been prepared by different individuals dealing with various aspects of the allegations. By way of example, the GEA removes powers from Municipalities and takes no meaningful account of the impact on health, endangered species, or local economy, tourism or property and business values, and the affidavits address all these concerns and more. The Application will eventually be heard by a panel of three Justices sitting in Ottawa. It challenges the GEA, the acts and omissions of the Ministry official who issued the REA, the Ministry permit to kill endangered species and the Ontario Energy Board’s cursory approval of the 28 kilometre long transmission line bisecting the County. 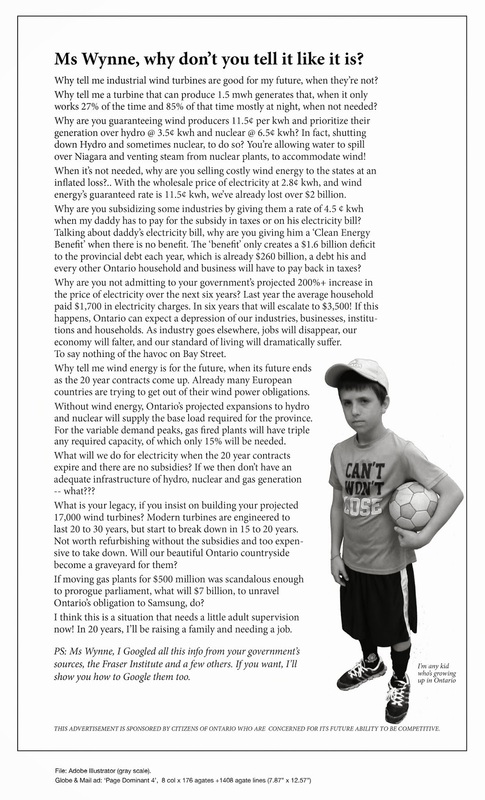 The JR has the potential to help protect all rural Ontario from the continued onslaught of these industrial machines. If you are an organization, coalition or individual anywhere in Ontario who has suffered as a result of actual or threatened installation of turbine projects, you may be able to assist in one of two ways. One, by applying to the Court for status as an Intervenor for which a lawyer is required for those incorporated, and, two, by providing us with an affidavit containing information not otherwise already dealt with. You only have to live in rural Ontario to know it is unfair.